I have met the most amazing man. He is awesome in ways I cannot gush enough about but one of the things that I love most about him is his deep love and connection with nature. He has a particular love and affinity for the owl, as do I! So, tonight as I was contemplating my feelings for this amazing person who has walked into my life, I took time to do a watercolour painting/sketch up of one of the birds he looks after. 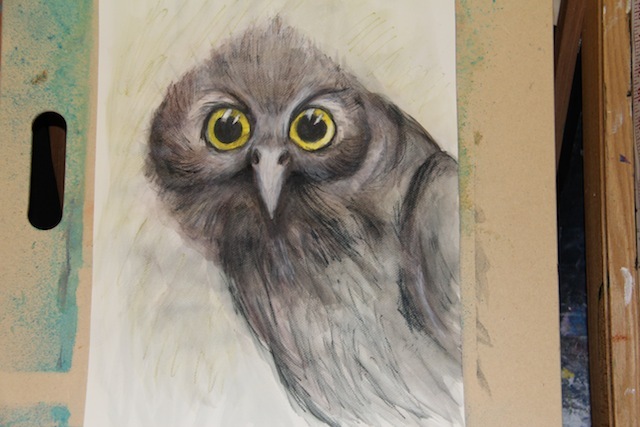 Owls are one of my absolute favourite birds and I have been drawing and painting them throughout my arty career. I love how they can convey so much interest and emotion through their eyes. For me, it is all in the eyes – it says it all if you have the quietude to stop and truly receive their silent message. Today was EKKA Public Holiday in Brisbane which, for those who do not live here in Brissy, this is the day of the Exhibition Show/Carnival. I didn’t go. I’m not much for massive crowds of people jostling to get down an alley to stand in line for a ride that most likely would result in my throwing up at the end of the experience. Pass on that one, thank you very much! So, I stayed home and did a whole lot of boring stuff. Then I thought about the fact that I have joined the gym and bags keep falling apart on me. It is SO frustrating. 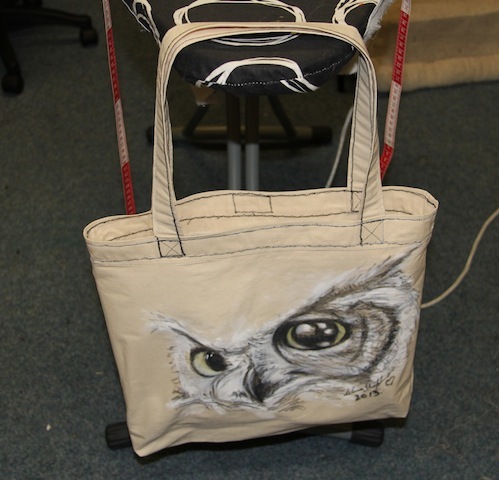 That was when I started looking at the owl I had hand drawn onto some un-strected canvas a while ago. It called me to create and who am I to say ‘no’ to that? 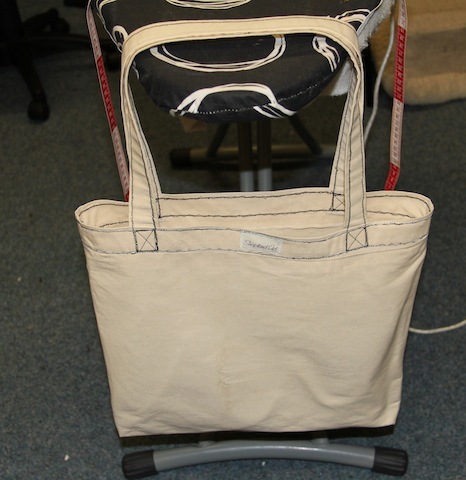 So I said ‘yes’ and began fiddling around with the canvas and before I knew it, my old faithful sewing machine was wurring madly as I created a tote bag. No pattern, just play. Here it is – Front and Back. I gotta say – I am so proud of myself! Yes, I am because I just played and this is what created itself. And most of all I love it! It’s rough. It’s ready. And it’s perfect for me. Internally, I am skipping around like a five year old expressing joy for living. Artistically, I am incredibly inspired by nature, especially animals. They have so much to express and in a way when I draw or paint them I see myself reflected through them. Owls are a favourite bird for me. I have been fascinated by their stealth, wise eyes and the graceful beauty that they carry with such magnificence. Many years ago, I used to go to Borders in Melbourne and spend hours looking through one big photograph book on owls. It was stunning and I think I have been in love with the wisdom that the owl represents to me for most of my adult life. One of my very first oil paintings was an owl portrait. I still have it. It is not the image above. The one above was just drawn freehand this morning with fabric paint marker and SoSoft Fabric paint on un-gessoed canvas. I plan to create a bag out of this piece of canvas once the paint has dried. 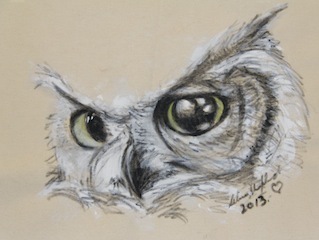 As I was drawing this image, the eyes of the owl were the feature for me. They are the windows of the soul as they say and I find this to be particularly true of owls. 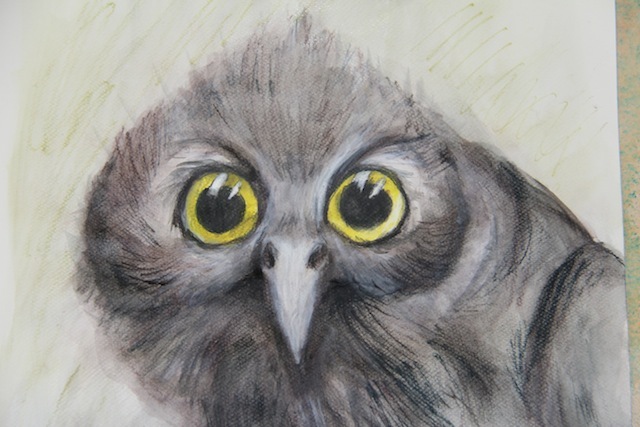 I have a love of drawing and painting eyes which has developed into a creative obsession over the years and so any animal, in particular, that I connect with through their eyes will eventually feature somewhere in my creative art work journey. This image above was a painting done in acrylic and oils. All of them are animal eyes. Unfortunately I no longer have this painting due to damage while moving. But I did love creating it. When I was in art school back when I lived in Melbourne, I discovered a love for eyes, lines and animals in particular. They have become a constant theme in my life’s artistic journey, so I am sure you will see more as time goes by. I want to encourage you to create, even if you feel you cannot. I did not take up art as a hobby until I was 25 years old. This was because when I was in my early teens, I had to do a speech at high school on a famous artist and there were some guys in the class that told me how boring I was. That was the day I put down my love of art and decided that I couldn’t do it. Of course, I did not realise at the time that I was allowing their comments to direct my life and I had owned their comments, thinking that I was terrible at art and that this was the last thing I could ever do… all from a comment about a speech I gave and had worked really hard to do. It seems silly now when I reflect on why I gave up art and felt myself unable to be creative… and that is the reason why I want to encourage everyone to indulge in their creative sides no matter what your medium is. I have learned over the years of going from drawing symbols to drawing what is in front of me that I have sold myself short. Art is a skill that can be learned and you do not have to have talent as such to do it, but you do need to be persistent and give yourself permission to do it badly at first. I have found this in myself and I am sure that I am not the only person who thinks their creative work is not good enough or can be too sensitive to the opinions of others… I have learned that art is about the reflection of who you are becoming day by day, moment by moment and that drawing badly is all part of the process. It is an invaluable part of the creative process because one day you just stop and realise – wow, I did that! and the image is beautiful to you and other people. So… the wisdom of an owl in my mind is to see the current step now as an opportunity to learn, grow and become what it is that you want to be in your life. To let yourself be faulty and make mistakes; to celebrate your imperfections which are beautiful character building opportunities and to fail as often as you can, but keep giving it a go, as that is when you will see yourself take off in flight! Make sure you check out my online art reference shop here on Selina’s World blog and get some reference books to help you to develop your own creative self – no matter what level you aspire to.